Video can be used on its own or in concert with the accompanying lesson plan. Video addresses warming of ocean temperatures as recorded since 1954, by scientists in the Bermuda Institute for Ocean Sciences (BIOS), and the potential impact of rising temperatures on thermal expansion in oceans, rising tides, heat energy added to storms, and changes in marine food chains. Comments from expert scientist: An excellent activity. Shows thermal expansion of seawater in a simple, straightforward, hands-on exercise. Good links for teachers and students to follow/explore. 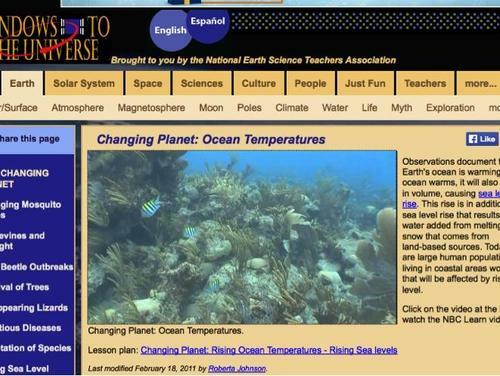 Video has a link to a lesson plan--Changing Planet: Rising Ocean Temperatures - Rising Sea Levels. Video touches a number of topics at a very general level. Video is nested on Windows to the Universe website but can be embedded elsewhere.